It has been a while since I posted. Things have been very busy, but I hope to be able to get back to the occasional post here now and again. To mark the New Year, I picked up two double IPA’s. This is the review of the first. Marshall Wharf is a brewery out of Belfast, ME. They make some very nice beers, but until recently, it was only available on draft. 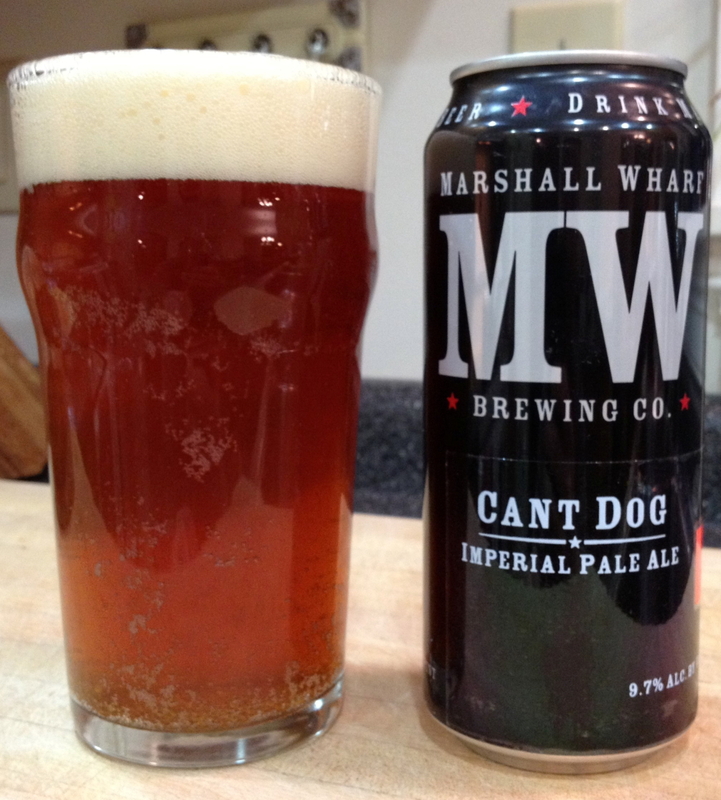 They added a canning line, and their Cant Dog has been a success. I would say it is Maine’s first really good stab at a double IPA that is packaged. On a personal note, I am growing more and more into a hop head. I still love my bitters for a kick back and have a few beers while watching the ballgame, but the different aroma’s and flavors has really changed how I look at these beers. It is like all of a sudden, there are more colors to paint with. Some hops mask the yeast esters to a degree, but some seem to meld beautifully with different strains of yeast. I am very much enjoying how those flavors compliment and work with each other, and to a large extent, the double IPA, as the unabashed king of hoppiness, are where you see the boldest strokes. Appearance — coppery, slight hazy, with a nice white head, leaving a nice lacing. Taste – Sweet citrusy notes at the front with tropical fruit (mango/pinapple). Slight piney, resinous background notes. It is a pretty dry beer, there is a nice bitterness at the end, cleans the palate nicely. Slight warming at the back. Critique — well, I have to say I am impressed. This is a very nice Double IPA. Lots of hops on the nose, and through the palate. Almost sweet from the fruit flavors. The pine is there, giving depth to the hop flavors. The rest of the beer does its job, it carries the hops, without getting in the way. It is light, and surprisingly drinkable at 9.7%. I preferred it to Hopslam, but I have to admit, I suspect if I drank Hopslam again, I would have a different impression then I did the first time, likely more from my perceptions changing then anything else.